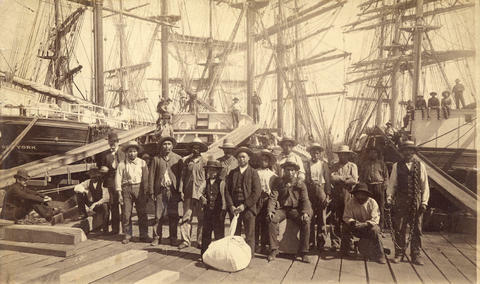 The man in the centre of the photograph with a laundry bag is William Nahanee. Four lumber vessels are in the background. J.S. Matthews' notes with prints in Archives. Note: Major Matthews has incorrectly identified the man standing with the laundry bag as a Chinese laundryman, he is William Nahanee. This photograph is also available as a copy print with identification on verso provided by F.W. Alexander to Major Matthews.